One of the most fascinating diamond rings is the halo ring. It’s built up from a larger central diamond, surrounded by one or several haloes, or rows of smaller diamonds in a pavé setting. The central diamond shape is generally a princess cut, but other diamond shapes like the marquise or oval and pear shaped diamonds are suitable too. The diamonds or other gemstones, including rubies and sapphires, are set in top quality precious metals like gold or platinum. 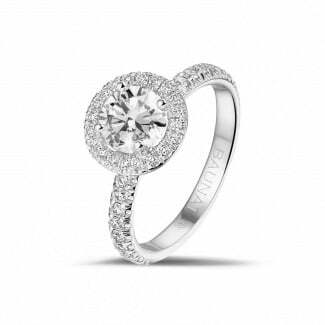 Is a diamond halo ring suitable as an engagement ring? 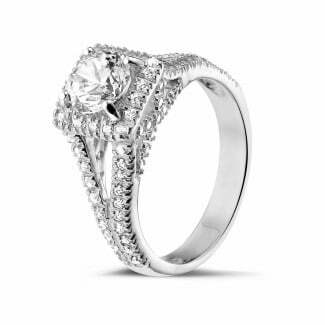 The halo ring was specifically designed as an engagement ring in the nineteen twenties. Would you like to ask your loved one to marry you just like celebrities and royals do? 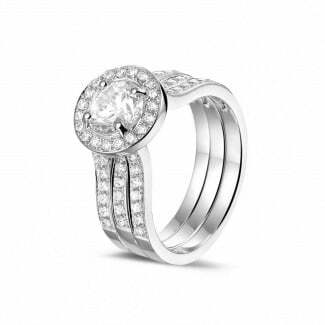 Then this ring is ultimately suitable, even if you don’t have a particularly large budget at your disposal. The stone will appear bigger by surrounding the central diamond with smaller stones. The beautiful shine of all the diamonds together will also create the illusion of one large diamond. 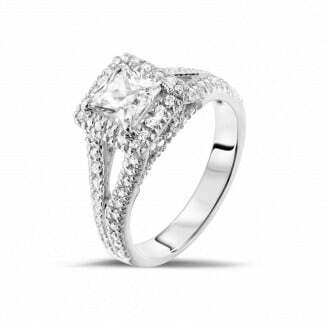 Our complete collection of diamond rings is made by hand for you. Our experts will ensure only the highest quality diamonds and precious metals are used. Can you not instantly find what you had in mind, despite our extensive collection? Then you can also arrange to have your ring tailor-made. Contact one of our experts. They are ready to be of assistance to you with professional advice. Can I buy a halo ring? BAUNAT’s entire collection is available online. Are you convinced of your choice? 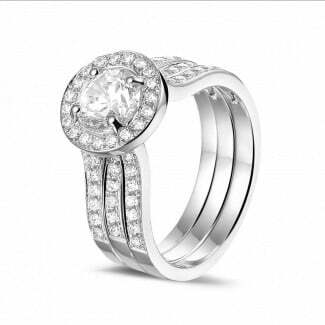 Then you will quickly and easily be able to order your ring online. We will also offer you a 20 year product guarantee with online purchases, plus you will be entitled to a 30 day return period. If your piece of jewellery doesn’t completely satisfy your expectations, you can easily exchange it.